With its vast array of seasons and road conditions, Canadian terrain poses a challenge for some cars. That’s why most Canadians love a good SUV. They combine the comfortable driving of a car with the utility of a bigger vehicle. Whether you’re hauling the family, or your hockey gear, there’s an SUV out there to meet your needs. The following is a list of some of the most popular. In 2016 alone, 350,000 new customers found their perfect vehicle in the Ford Explorer. Building from their success, Ford did not disappoint with the 2017 Explorer. 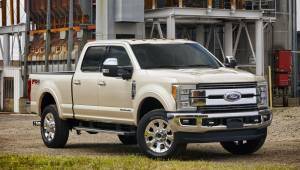 You have the option between a standard 3.5L Ti-VCT engine, a powerful 2.3L EcoBoost engine, or a 3.5L EcoBoost engine. The standard 3.5L Ti-VCT delivers 290 horsepower and 255 lb.-ft. of torque, while getting you 12.0 L/100 km (24 mpg) combined. The seven-passenger SUV comes fully equipped with intelligent 4WD, terrain system and a Hill Decent Control functionality. In a nutshell, this is a high-performing SUV. The NHTSA gave it a 5-star rating for safety, so you know you and whoever else you’re driving around are top of the line protected. With such features as the Forward Collision Warning system, Lane Keeping System and trailer sway control, the Explorer is an excellent all around utility vehicle. When it comes to owning a vehicle, one of the first considerations is price. The tag on this beauty stands at $39,877 for the base version and $68,805 for the platinum trim, a competitive price in the market place. Mercedes is known for elegance, power and luxury. The Mercedes-Benz GLE Coupe is no different. The sleek car offers 249 horsepower from a turbo-charged V6 diesel engine. The vehicle is also fitted with a 9-speed automatic transmission with an ECO Start/Stop system. It’s a performance powerhouse with excellent efficiency and low emissions. Luxury is seen even down to the minute details, like in the signature Mercedes hand-finished wood accents and leather elements. The SUV comes in a sports edition, the AMG version and a hybrid model for the high fuel efficiency lovers. The interior features only add to the feel of luxury. 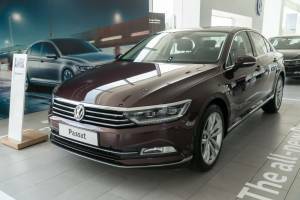 It comes with auto-dimming mirrors, dual-zone-climate control, 4G LTE data connection, LED accent lighting and a telescopic steering wheel. Technology based safety features are also available, including a blind-spot monitoring system, Active High Performance LED headlights, and cruise control. The 5-door coupe comes with a 3.0L V6 Bi-Turbo engine that produces 362 horsepower and 384 lb.-ft. of torque. You can expect to get 13.6 L/100km city and 10.2 L/100km highway with a 9-G TRONIC PLUS Automatic transmission. You can also opt for a 5.5L V8 Bi-Turbo engine, which will get you 577 horsepower and 561 lb.-ft. torque. With this engine combination, you can expect to get 17.2 L/100km city and 12.8 L/100km highway. On the downside, the GLE is an expensive automobile that is not as comfortable as you would expect for money you are paying, due to the standard suspension. The lack of control around turns, as well as the above issues are things to consider when you’re looking at purchasing a GLE. Land Rover’s ability to deliver on quality is quite evident in the 2017 Range Rover SVR. The vehicle is focused on luxury and performance, delivering a strong state of the art sports utility vehicle. It delivers a comfortable 340 horsepower from its 3.0L Supercharged V8 engine, achieving a top speed of 260 km/hour thanks to its 8-speed automatic transmission. You can expect to get 12.8 L/100km (22.1 mpg) combined. The interior is what sells the 2017 model. It comes with a perimeter alarm system fitted with engine immobilization capabilities for extra security. As a safety measure, the standard airbags are fitted in the car with additional thorax, side and pelvis areas. For the media lovers, this is the vehicle for you. Its sound system comes fully equipped with 19 speakers, a home link system, InControl services with a Wi-Fi package, climate control, auto dimming mirrors and a blind-spot monitoring system. Other than the fashionable interior, the Range Rover offers an amazing off-road experience thanks to its 4-wheel drive (4WD) feature. Even with such amazing features, there is one major drawback – the price. At an MSRP of $111,350, the Range Rover SVR is priced for an upscale market. However, if money is not a problem, this is a beautiful car to own. The Honda CR-V has been a trusted vehicle because of its greatest asset – reliability. Buying the 2017 Honda CR-V model gets you a simple, roomy interior that utilizes modern technology, and a stylish body that offers a comfortable seating capacity for 5. You can choose between four trims: LX, EX, EX-L and Touring. They each have a 1.5 L turbocharged 4-cynlinder engine that produces 190 horsepower and 179 lb.-ft. of torque. The front-wheel drive LX trim gets 8.4 L/100km city and 7.07 L/100km highway. For AWD, you can get 8.7 L/100km city and 7.2 L/100km highway. The vehicle’s safety features include an electric stability control, an ABS system and a Driveline Traction control system. Thanks to technology, a blind-spot information system, collision mitigating brake system, rear traffic warning system, low tire pressure warning, road or lane departure warning system and an airbag occupancy sensor are all fitted on the car. By all standards, the price tag on the vehicle of $26,690 is a real bargain with the features that come fitted in the car. The off-road experience may not be thrilling but other than that, it is a car built for a budget. If you’re looking for quality and pleasure while driving, the 2017 Mazda CX-5 should be one of your top choices. The 4WD, 5 passenger SUV comes with either a 2.0 L or 2.5 L SKYACTIV-G engine that produces 187 horsepower and 185 lb.-ft. of torque. The vehicle offers mid-level touring with a 2WD powertrain. It offers a spacious interior with leather crafted seats at a cost. The sporty looking Mazda CX-5 is complemented by a powerful entertainment section – a MAZDA CONNECT infotainment center, a voice command system and an automatic emergency system. The standard safety features are also part of the car. The electronic stability control, a blind spot sensor, rear collision and seat-mounted airbags all work to improve the safety of your passengers. 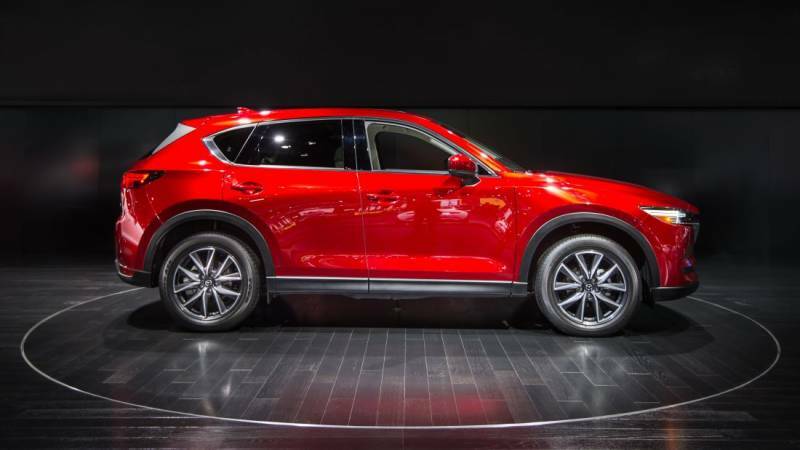 Buying the affordable Mazda CX-5 will come with many benefits. It has sporty handling, a great fuel economy and a good drive train. However, considering the body weight of the vehicle, the engine is underpowered as was the case with its predecessor. This, according to customer reviews, offered a sluggish feel on the highway. Considering the $24,900 price tag, the Mazda CX-5 appeals to the budget conscious driver who requires a safe vehicle over a powerfully performing one. The listed SUVs offer a reliable driving experience within Canada and the world as well. Whether you’re driving off-road or downtown in the city, they offer a fantastic way to cruise around.